(NEW ALBANY, Ind. 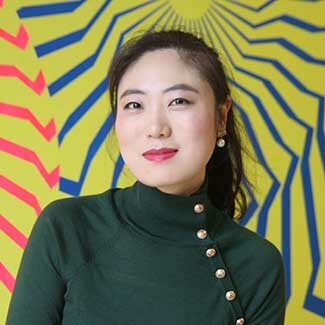 )—Yunmi Choi, assistant professor of strategic communication, can explain why classic rock is used in beer and truck commercials during football games. It’s because of the reminiscence bump, an advertising term used to describe the enduring resonance of our “glory days”—that period of time between the ages of 15 and 25 when most of us collect experiences and discoveries to which we remain attached for the rest of our lives. By sampling the soundtrack of boomer nostalgia, advertisers hope to ride that emotional connection all the way to the point of purchase. Bringing students up to speed on contemporary advertising and market strategies like the reminiscence bump, and the thinking behind them, is only one part of Choi’s contribution to classroom innovation, albeit an important one. If today’s communications climate is a hurricane of novelty, Choi helps her students find the eye—a space of calm in which they have time and distance to analyze and critique the surrounding swirl. What sets Choi apart, immediately, is her apartness. Instead of burying that first impression of otherness, she embraces and amplifies it as a crucial teaching moment. In her course on persuasion, for example, she uses cultural differences to highlight assumptions that communicators may make about their audience. She challenges students to become more conscious of spoken and unspoken norms, hidden expectations, blind spots. To understand communication, and to practice it well, you have to understand the context in which it takes place. “Know your audience” is a useful truism, but what does it really mean? Choi teases apart the threads of this dictum by encouraging students to think of their audience in more nuanced ways, to grasp the background, motivations, and experience of individuals who are most likely very different from themselves. 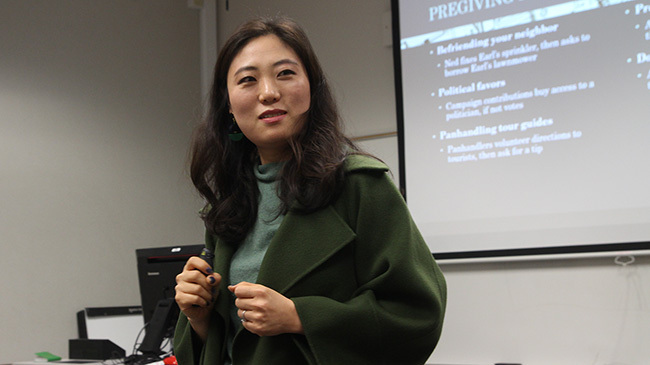 Dr. Yunmi Choi turns lectures into dynamic two-way conversations that challenge students to explore other cultures and viewpoints. This humility is the key ingredient in her approach to communication, especially the forms of communication that have to do with business or politics, where there is money or power in play. They learn is that diversity is not just a nice thing, it is a fact of life. It’s also a big part of every business model that wants to succeed in the global economy. In her course on media in the global context, Choi drives the point home through videos that give students direct access to other cultures. In this way, Choi makes connections between the personal and the global, bringing mega-trends in communication down to the level that most of us routinely experience, in personal relationships and organizational culture. The goal is to understand where someone is coming from—but also where they are going and why. In Choi’s world, the humans are complex. They may be physically here, but psychologically somewhere else. They are echoes and dreams, carrying history and hope with them through every day, every encounter, every utterance. For Choi, communication, especially strategic communication, which has a purpose, begins not so much with knowing what we want to say, but knowing those to whom we want to speak. “Every household has its own culture,” Choi said. If it’s not based on awareness, it’s just noise. Choi is a big thinker. It’s what took her from her native Korea out into the world. Early on, she dreamed of writing the greatest novel the world had ever known. “I was dreaming,” Choi said. But there was something logical in that dream. If she was to write such a novel, she would have to experience the world. “Otherwise, I’d have no clue what’s out there,” Choi said. Her parents encouraged her wanderlust, and she came to the U.S. to study, eventually gaining undergraduate and graduate degrees in advertising at Michigan State while overcoming culture shock, language barriers and her own inner resistance to specialization. Advertising was specialized enough to be practical but general enough to be satisfying. “Advertising applies to everything from English to psychology to science,” Choi said. She gained broad experience in the advertising world, but found herself continually drawn back into academics. At some point she recognized it as her destiny. Her Ph.D. in mass communication, presentations and academic publications dealt with social networks, a relatively quiet branch of the field—until it blew up. Researching corporate motivations and privacy issues around Facebook pages, newspaper credibility in the digital era, the intrusive impact of Twitter social media marketing, Choi seems to have been prescient. The world has caught up, and her courses are relevant, if not downright topical. With her field in the spotlight, she has all the theoretical tools to help her IU Southeast students grapple with the informational ecosystem that has sprouted up around them. In a field dominated by instructors with commanding agency experience, Choi cuts a more unusual figure as a specialist in theory. While practical experience is vital to nurturing employability, theory is essential to understanding the background of the field, and in a wider sense, to informed citizenship. It’s important for students of communication to master tactics like the remembrance bump. But it is just as important for them to recognize themselves as potential objects of persuasion, vulnerable to the appeals of advertisers as well as the machinations of Twitter bots. This is where literacy becomes empowerment. Choi is a digital native. She got her first computer at age six. She wrote her first complete sentence at a keyboard. She is completely familiar with this technology, but not wowed by it. This gives her a critical edge that she seeks to pass on to her students, most of whom have also not known life without a graphic user interface. Getting behind the information delivery system du jour—be it radio, television, computer screens or iPhones—to analyze the human behaviors that drive communication, this remains the core of Choi’s academic expertise, and the lasting value of her courses for students.